Mark Godsey, OIP co-founder & director (left), and Brian Howe, OIP staff attorney (right), stand with Rickey Jackson (middle) during exoneration proceedings. 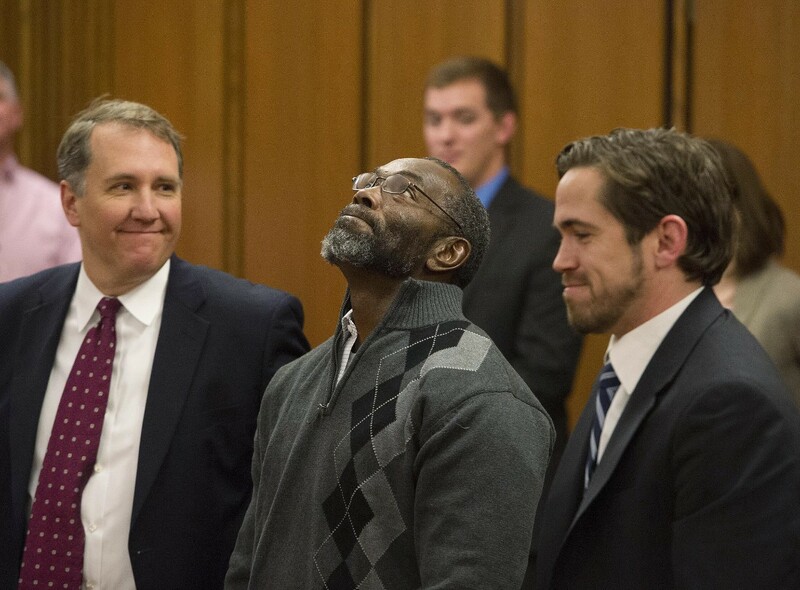 Jackson spent 39 years in prison for a crime he didn't commit. Welcome to the Ohio Innocence Project at Cincinnati Law, where our goal is simple: we want to free every innocent person in Ohio who has been convicted of a crime they didn't commit. We’re proud to be a part of the University of Cincinnati, where we made our home in 2003. Since our inception, our work has led to the release of 28 wrongfully convicted Ohioans, who collectively served over 525 years behind bars. That makes us one of the top-performing members among the international Innocence Network. 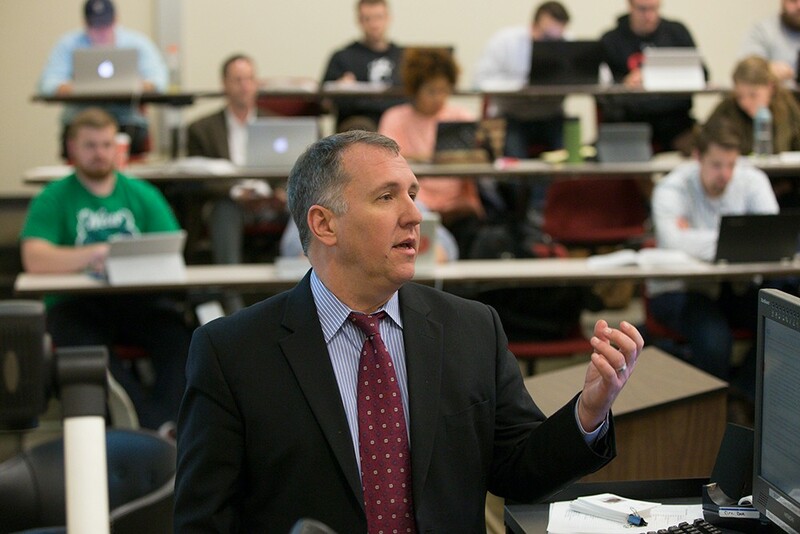 Our work includes helping develop and advocate for lasting criminal justice reform through legislation as well as launching Ohio Innocence Project University, an active network of student groups at colleges across the state. the tireless dedication of the innocent and their champions, whose strength, courage and resilience inspire us daily. 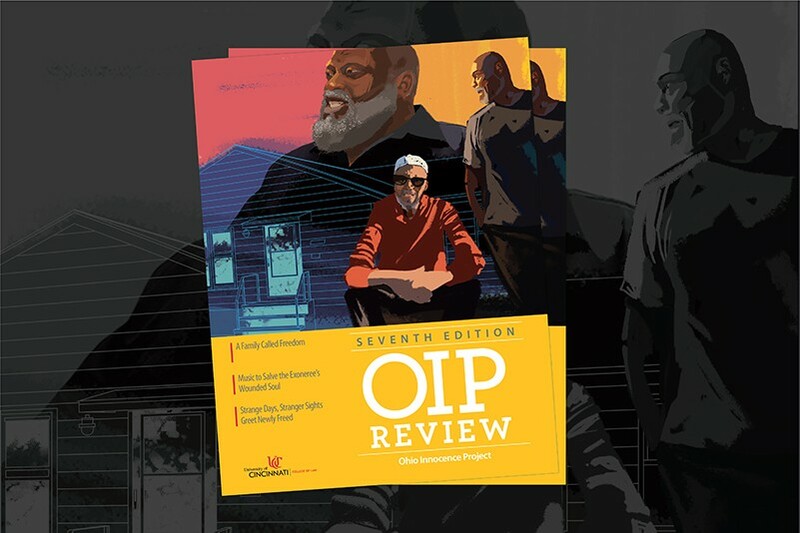 The OIP Review is an annual magazine covering OIP's efforts to fulfill its mission. Each year, the Ohio Innocence Project at Cincinnati Law, which ranks among the most successful projects in the Innocence Network, selects a team of 20 law students, the majority of whom are in their second year, to serve as Fellows. OIP Fellows and staff spend many hours reading and writing letters and having telephone conversations with inmates about their cases. Prior to actively taking on a case, if not before, the OIP staff and Fellows will meet the inmate in person to discuss the case, the plan for litigation and the expectations of the inmate and the OIP in the case. From May through August, the Fellows work 40 hours per week and receive a small stipend for their work. During the academic year, the Fellows work approximately 10 hours per week and receive class credit for their participation. To apply to be an OIP fellow you must be an admitted student to the College of Law or a current first-year student. Instructions to apply can be found on the admitted students fellowship page. At the Ohio Innocence Project, our attorneys and students work hard to help wrongfully convicted inmates get out of prison and get the justice they deserve. You can join our staff and students as a volunteer or intern to help the wrongfully convicted. Our internship program is unpaid. The time commitment is 10 hours per week. The program runs from semester to semester based on the University of Cincinnati’s academic calendar. Each semester, you must re-apply to be considered but we make no guarantees you will be able to participate in the program for longer than one semester. All applications will be reviewed and responded to by the manager of the internship program. If you qualify and we are interested in learning more about you, an interview at the OIP office will be scheduled. To inquire about volunteer opportunities (non-internship) with the OIP, please email Stephanie King at kingsp@ucmail.uc.edu and include your resume and what your availbility is. An inmate requesting the assistance of the OIP should complete the Screening Application (pdf). The inmate must FULLY COMPLETE the form and submit it to the address on the form, otherwise it will be returned and no further action will be taken until returned complete. Print out a hard copy of the application, fill out in ink, and return it by mail if you would like the OIP to review your case. The 3rd Annual Bearcats Dash & Bash takes place on Sunday, October 7, 2018! Help support the Ohio Innocence Project & UC Athletics by registering for the Dash & Bash today. UC College of Law professor Jennifer Bergeron tells "Cincinnati Edition" how 26 defendants have been freed with help from UC students and faculty.